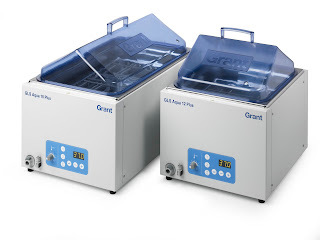 Grant Instruments, a supplier of scientific, life sciences and data acquisition products, is targeting molecular biologists with the launch of its precision engineered GLS Aqua Plus series linear shaking water baths. The GLS Aqua Plus series includes a choice of two models (12 and 18 litre) and features a robust patented, high quality magnetically coupled shaking mechanism which provides maximum reliability, consistency and quiet operation. The baths include a drain tap to allow easy tank emptying, two programmable temperature and shaking presets for rapid selection of commonly used set points, a countdown timer with audible buzzer, and non-drip polycarbonate lids. The see-through gabled polycarbonate lid not only improves performance of the baths but limits evaporation, reduces contamination and conserves energy. The new models boast precision temperature control throughout the operating range of ambient +5°C to 99°C with ±0.1°C stability and uniformity. A wide range of accessories is also available for the GLS Aqua Plus range - including flask and test tube trays, test tube and microtube racks - to provide exactly the right solution for your application. The GLS Aqua Plus series linear shaking baths have been designed for molecular biology applications such as hybridisation, producing bacterial culture media and for solubility studies. 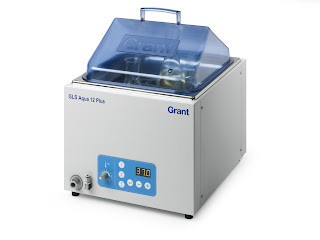 Like all Grant products, the new water baths are built to last and are manufactured using only the highest quality materials and come with a 3-year warranty as standard. The Aqua Plus family of water baths complement the existing Grant Optima™ series of stirred thermostatic baths and heating circulators and are part of Grant’s comprehensive range of scientific products. This includes block heaters and coolers, baths/circulators and re-circulating chillers, and under the Grant-bio brand, thermoshakers, rockers, rotators and shakers, centrifuges and vortex mixers.